Welcome to STATUE M A R V E L S! All times are GMT -3. The time now is 09:29:28 PM. I have finally being able to catch up on this piece to our fella Al, I will be posting WIP pics here of the building up and paint job. Its being fun to be working on this project and my thanks to Al for his understanding and patience. I have been dealing with some family issues and thanks folks for not asking what it is . See you guys next step. Last edited by Helder M.; December 16th, 2010 at 05:25:18 AM.. I loved that ROM statue. I was lucky enough to have gotten one of the MB, but the statue is beyond words!! You are such a tease Helder! First off, I want to say thank you to Helder for starting this thread. I am very excited about seeing the WIP pics for ROM Spaceknight! As many of you know, I already have this sculpt by Helder from several years ago. Danno did the paint job on that one and we went with the silver look of the first several issues of ROM Spaceknight. This time, I wanted to go with the white look with light blue shading used in later issues. Helder was happy to comply. I can't wait to see how he turns out. ROM Spaceknight is up there with Hulk, Cap, Iron Man and The Micronauts for me. He is one of my all-time favorite characters in comics. 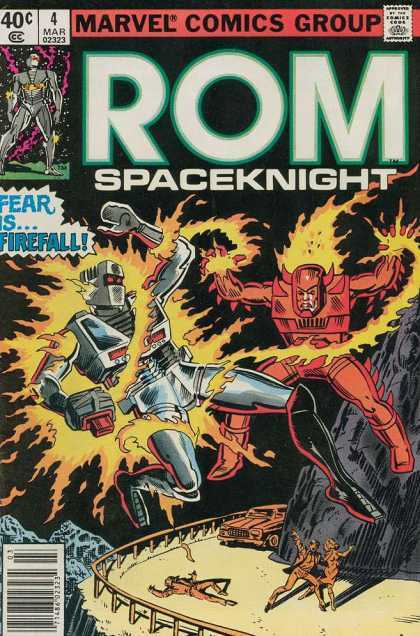 I would say that the first 25 or so issues of Rom Spaceknight are among my most treasured comics. You're a lucky man to have 2 of these, Al! I'm looking forward to how this one looks when complete. I just hope Helder gets around to doing Archie Stryker as the Spaceknight, Firefall eventually! Besides ROM, he was my favorite! after sending it off it got the final coat of primer to smooth out the surface ! its almost there at this stage I will apply a coat of clear coat on top of it to seal the paint job after that I'm going to the base . ROM Spaceknight is looking great Helder! I especially love the light blue highlights! wait until you see it in person unfortunately pics wash al way the effect glad you like it .